LAHORE – The Defense Housing Authority (DHA) has changed the burial policy but have failed to live up to the DHA members’ demands, Pakistan Today has learnt. Sources in DHA said the members had a ‘long-standing’ demand with the DHA to allow the burial of the son-in-law, daughter-in-law, grandkids and grandparents. Members voiced that such people were also family members and graves must be provided to them as well, sources added. However, DHA did not live up to the aspirations of the residents and amended the policy, only allowing the burial of mother-in-law, father-in-law, divorced son and daughters of the DHA members, Mrs Shahida, Phase III resident, complained. 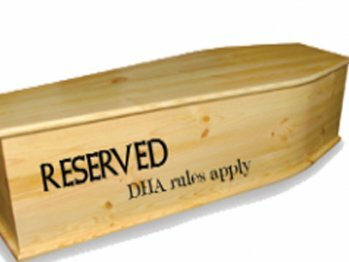 DHA Resident Association President Rohail Ikram told Pakistan Today that according to the previous burial policy (graveyard policy), only members, their parents, sons and daughters were allowed to be buried in DHA graveyard. Making the policy more compatible, he said, DHA approved some amendments in the meeting of the governing body but the changes were not in line with the demands submitted by the DHA residents. He said that DHA Resident Association also spoke against the irrational amendments and urged upon the DHA administration to rationalize the burial policy. Rohail vowed to take up the issue in coming meeting with DHA administration and called upon the high-ups to review the new policy. NEW BURIAL POLICY: According to the new burial policy, sources said, the members will have to inform the complaint office of the death, provide photocopy of the allotment letter and the CNIC, for verification through the security branch, and on verification, a receipt will be issued for a grave digger and other all allied facilities i.e. ambulance, stretcher, sheets, charpoy etc. All these facilities will be provided to the members free-of-cost. For the burial certificate, the members should apply on plain paper to additional director maintenance, who after checking the record, kept by the Maintenance Branch, will issue the certificate on the next day from the date of applying. According to the policy, to obtain the permission to cement the grave, the concerned member will apply to the additional director maintenance, seeking permission through an application accompanied with a CNIC copy. Maintenance Branch, after verification, will grant permission letter, which has to be handed over to the grave digger, who in compliance with the policy, will cement the grave.